Contains premium organic and wild-crafted essential oils of Lemon, Orange, Geranium, Lime, Blue Tansy, and Ylang Ylang essential oils. Charity™ blend was specifically formulated for the Be Young signature Emotional Aromatic Touch Modality™. 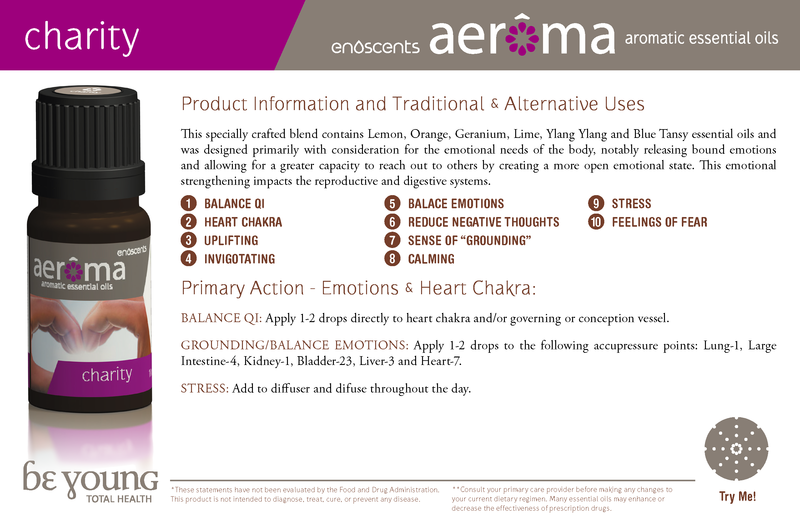 This combination of essential oils has a powerful balancing effect on the fourth chakra, which influences the heart. Charity™ blend is meant to balance and restore the body's energy pathways and emotions, diminishing feelings of anger, distrust, grief, or abandonment. Charity™ blend empowers the user to release bound emotions and experience overall wellbeing. Apply 1-3 drops in the palm of hands inhale and rub excess through hair. Apply 2-5 drops on location of 4th chakra. Use with Emotional Aromatic Touch Modality. To balance paricardium meridan apply Charity™ to the acupressure points of the pericardium meridan. Can be used with Yin™ and Yang™ blends to enhance the balancing affect of Charity™ blend.